Categories: Azhwars, Kshetra, Sri Muralidhara Swamiji, Sri Swamiji's Kirtans. 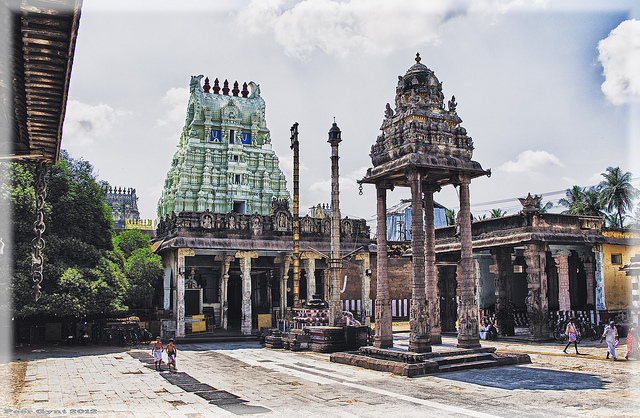 This month we will be visiting the holy town of Kanchipuram. One cannot explain the holiness of this town in words. It is one of the seven mokshapuris (towns that bestow liberation) and the only mokshapuri in South India. Lord Vishnu appears famously in Kanchipuram as Varadaraja Perumal, which is a divya desam kshetra. The Varadaraja Perumal shrine itself is situated on a small hillock known as Hastagiri and devotees have to climb 24 steps to have darshan of the Lord. Another specialty of this temple and deity is the famous Garuda sevai (vahanam) during the annual brahmotsav celebrations, which is special among all Garuda sevais and is also mentioned by Sri Swamiji in his kirtan below. Kanchi kshetra and Sri Varadaraja Perumal were also the home of Sri Ramanujacharya, who spent his formative years in this holy town, worshipping and serving Varadaraja Perumal. In this article, we will see a beautiful kirtan of Sri Swamiji, on Varadaraja Perumal in Kaanada raga. Sing of Varadaraja, sing of the King of gods! He is One who yields fruits from the tree of Muralidhara’s merits!